Which Burns More Calories Running or Elliptical? Bethany Kochan began writing professionally in 2010. She has worked in fitness as a group instructor, personal trainer and fitness specialist since 1998. Kochan graduated in 2000 from Southern Illinois University with a Bachelor of Science in exercise science. She is a Certified Strength and Conditioning Specialist, Certified Personal Trainer, Medical Exercise Specialist and certified YogaFit instructor. You have many choices when it comes to cardiovascular exercise, including running or using an elliptical trainer. Often the goal of a cardio workout is to burn as many calories as possible in the shortest amount of time. 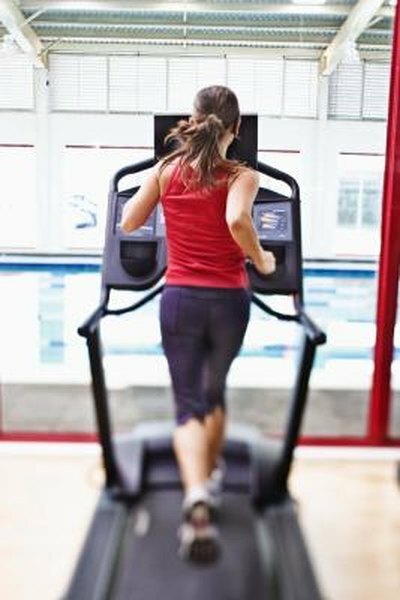 If you compare running on a treadmill to the elliptical, the calories burned are comparable, but running outside may burn a few more calories than compared with an elliptical trainer. A 155-lb. person running at 5 mph can burn approximately 594 calories in one hour, according to Harvard Medical School. If this same person runs at 7.5 mph for an hour, she can burn approximately 930 calories. In one hour on the elliptical, a 155-lb. person can burn approximately 670 calories, but this does not take into consideration speed and resistance used, only the activity and body weight of the individual. Intensity positively correlates to caloric burn, according to the American College of Sports Medicine. The harder you exercise in a given amount of time, the more calories you will burn. So even though running at 5 mph is easier than 7.5 mph, if it is very challenging, you could burn more than 594 calories. Also, if you work out on the elliptical for an hour but you keep your intensity low to moderate, you will not burn the entire 670 calories. Another factor to consider is that your body will adapt to exercise and activities you do often become easier to perform. For example, if you have been running at 5 mph five days per week for a year, this workout is easy and you will not burn as many calories as you did when you started. An elliptical may burn more calories for you because you are not used to the activity. As your body adapts, it becomes more efficient so you need to change the activity and/or intensity of your workout to see continual progress and burn calories. The frequency and duration of your workouts should be chosen based on your goal. If you want to improve your health and/or make a small impact on your weight, perform cardio three to five days per week for 20 to 30 minutes at a moderate to high intensity. If you want to see significant improvements to your health, fitness and/or body weight, perform cardio five to seven days per week for 30 to 60 minutes. You can alternate running and the elliptical to see continual progress. Can 1800 Calories a Day Make Me Fat? Does Jogging Reduce Thigh Size? When Do You See the Results of Weight Loss?